Fine-tuned absurdity: Simon Gwynn reviews the return of David Grieg’s stage adaptation of Dr Seuss to the Old Vic. The Lorax at the Old Vic Theatre. 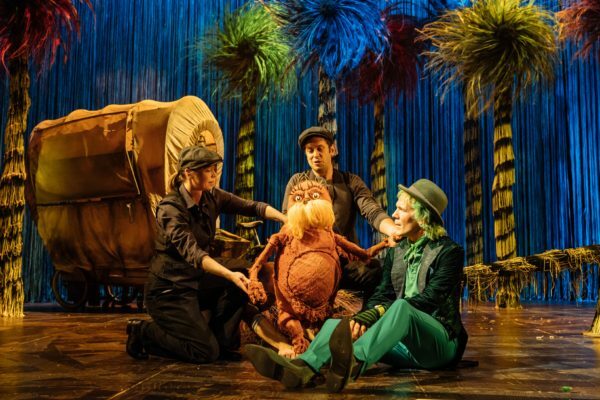 Back at the Old Vic before a tour of the US, this adaptation of Dr Seuss’s 1971 eco-propaganda text (regarded by the great subversive author as his finest work) is a sensory feast and a remarkable achievement in the difficult genre of family entertainment. It’s the story of the Once-ler, who comes from a family that lives in hardship, mining moof to make clothes. Tired of their small horizons, he sets off to seek his fortune and stumbles across a paradise filled with brightly-coloured Truffula trees, on which grows wonderfully soft tufts. After the Once-ler chops down a Truffula tree to obtain its tufts, we meet the Lorax, a small orange Walrus-like character who claims to “speak for the trees”. He implores the Once-ler to refrain from cutting down any more trees, and the Once-ler agrees. But after discovering an endless demand for thneeds, the multi-purpose garment he knits from the tufts of the Truffula trees, the Once-ler is pressured by his greedy family into going back on his word. Soon, the Lorax’s beloved forest is on a one-way path to oblivion. There’s a political message in the story, and if you want your younglings to have a career in US Republican Party politics when they grow up, maybe stay away. But while the idea that natural resources need to be protected might have been sort of radical in 1971, I suspect that for the kids watching this today, it’ll be a truism sufficiently banal as to barely be worth commenting on. See also: capitalism corrupts. We’re all used to the “two-track” approach to family entertainment more or less ubiquitous in Hollywood’s CGI output, in which jokes for the grown-ups are hidden as Easter eggs in a product superficially aimed at children. Max Webster’s production is nothing like that: instead, it achieves a cohesive style that genuinely ought to appeal to people of all ages in the same way. Much of this is down to David Greig’s terrific script, which deepens Dr Seuss’s brief story without losing its sense of frivolity, and adds enough contemporisation to make it zing without feeling forced. The visuals and sound are just as good: from the all-green get up of the Once-ler’s family to the glittery pink leotards of the vulturous lawyers who convince him to rip up his contract with the Lorax, the show constantly made me reflect sadly on how much brown and grey there is in our real urban environments. The set is full of absolute treats, not least after the money starts rolling in and the Once-ler swaps his office furniture for a desk three times as wide and a chair three times as tall. And the sound effects seem precision-engineered to trigger the neurons associated with a kind of pleasure that rarely features in adult life. It’s a real shame that Seuss’s approach to humour and storytelling hasn’t become more widely influential. With a couple of exceptions – the work of Reeves and Mortimer comes to mind – we just don’t see enough of this fine-tuned absurdity in adult land. And theatre is perhaps a better place for it than any other. The Lorax is on at the Old Vic until 5 November 2017. Click here for more details.